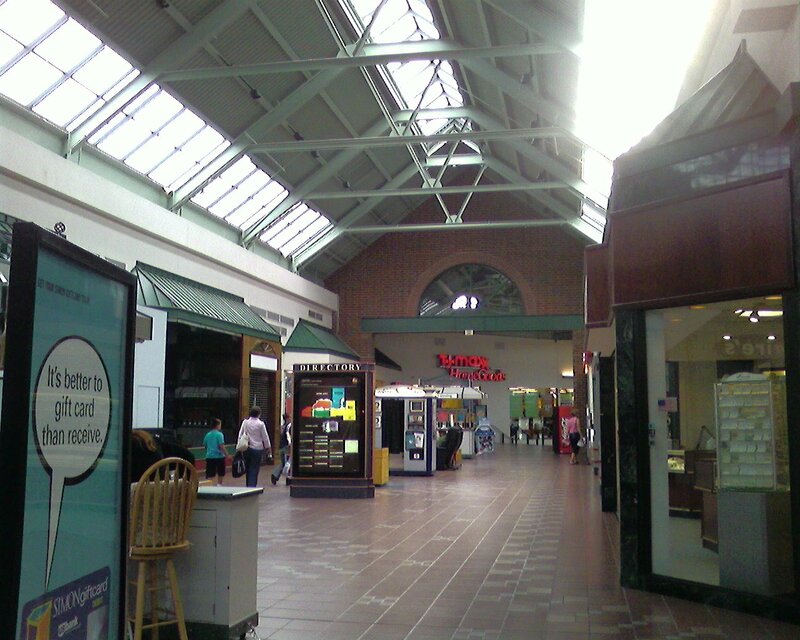 In addition to the Worcester Common Outlets, the city of Worcester is home to another, smaller enclosed shopping mall: the Greendale Mall, on the city’s north side, near the junction of Gold Star Blvd (MA-12) and I-190, not far north of the junction of I-290. Anchored by Best Buy, Marshalls, and TJMaxx N More, nearly everything about the Greendale Mall identifies it as an ancillary mall, from the TJX anchor tenants to its diminutive size (311,436 square feet). However Greendale has always felt a bit more significant. 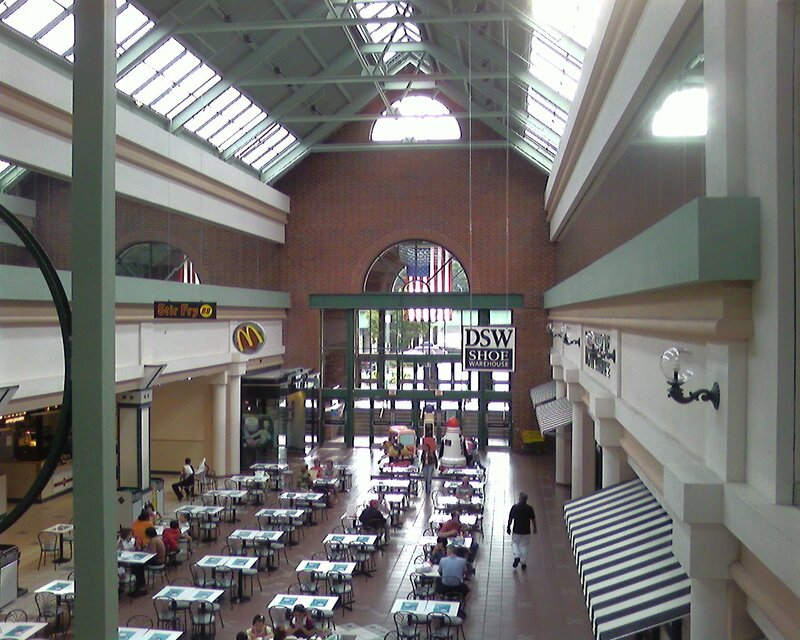 For one, it’s home to a few things rarely found in smaller malls, such as junior anchors like Old Navy and DSW Shoe Warehouse, and a food court that’s situated on its own mall level, sunken and off to the side of the main level. 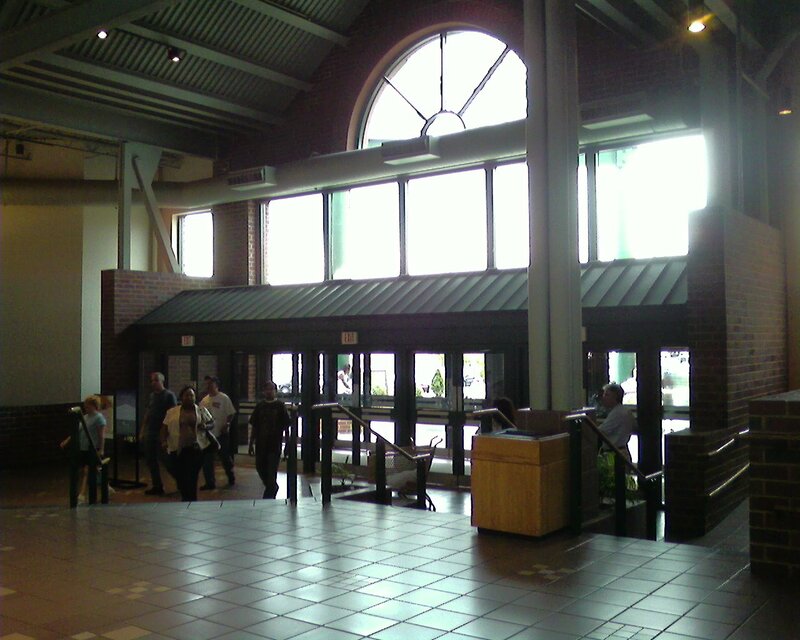 In addition, the Greendale Mall sports some really neat architecture, especially inside: like the Arsenal Mall in Watertown, Massachusetts (a favorite of mine which will be posted about soon), the mall was carved out of an old brick industrial building, and as such it sports a character-laden mixture of historic architecture and more modern mall decor, and appropriately mirrors its surroundings in the industrial revolution-era metropolis of Worcester. 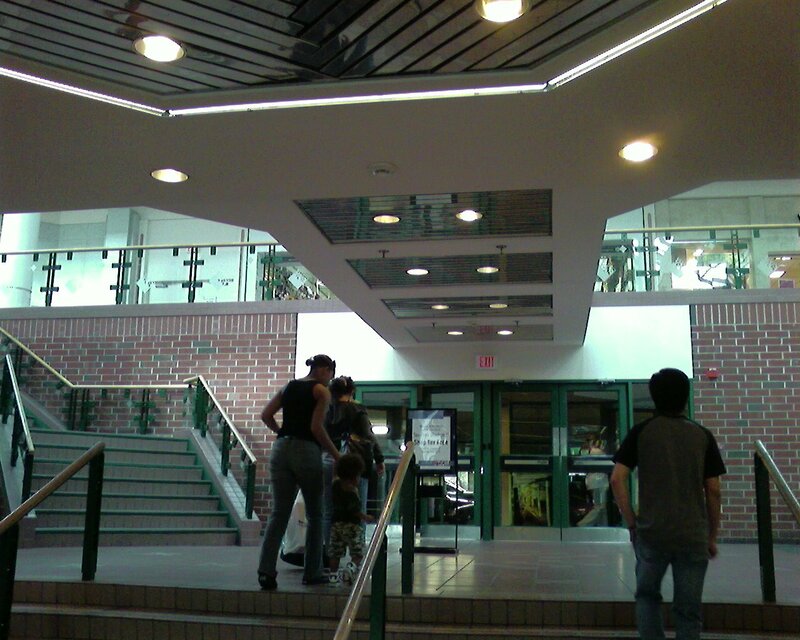 The uses of exposed brick and a slightly odd floorplan with much of the parking tucked under the mall and accessible via a small basement level only reinforce this. Despite being a relatively local mall of mine, I know quite little about the Greendale Mall’s history. Judging by some of the elements of the mall’s decor, I would imagine it was part of the mall-building spree by Steven Karp’s Malls of New England Development in the early 1990s or late 1980s, likely with Lechmere and Marshall’s as its original anchors, and I am certain that the TJMaxx N More anchor (which is located down a side hallway) was added sometime in the late 1990s. 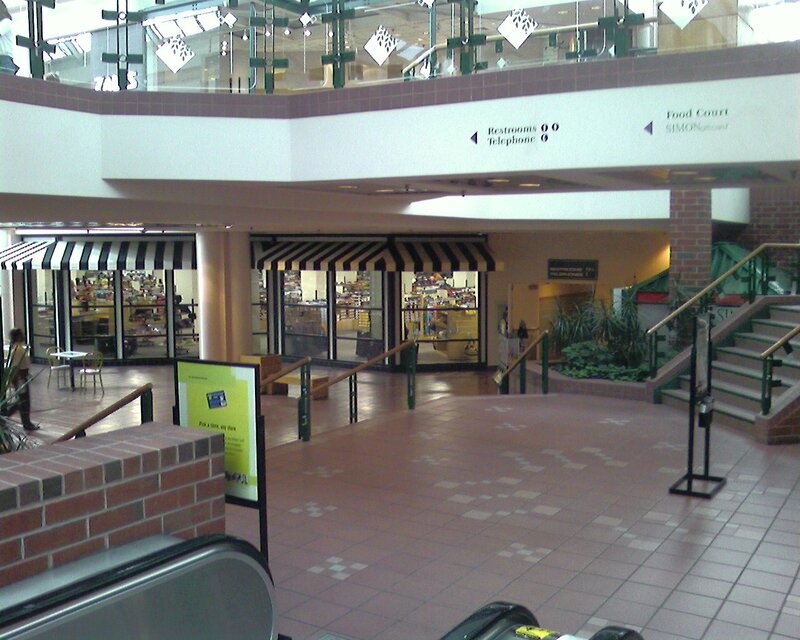 Lechmere closed at the mall in 1997 when their troubled parent, Montgomery Ward, savagely dumped the entire chain. 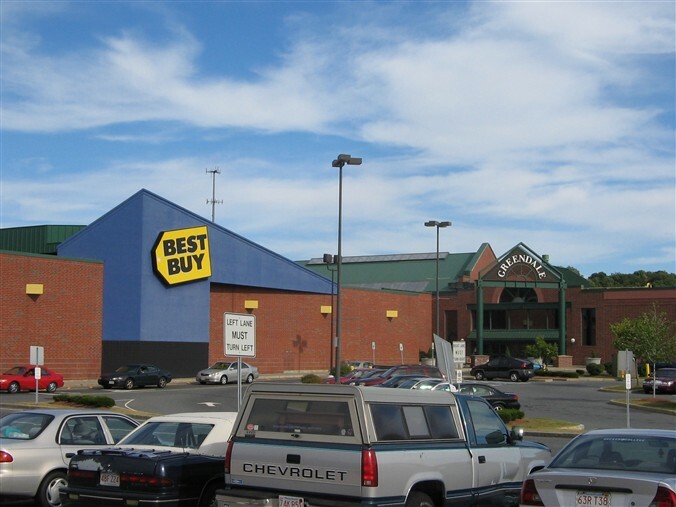 Lechmere was replaced by Best Buy in 2000 or 2001, though I can’t pinpoint the precise year of that change. 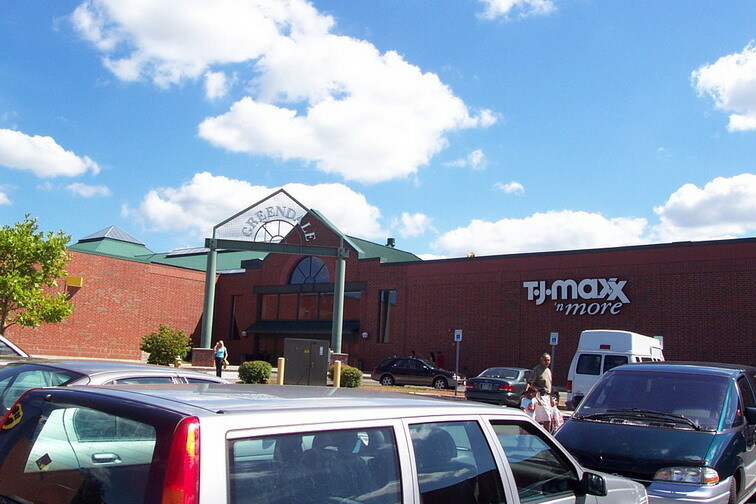 Greendale Mall has been owned by Simon since 1999, when it was sold to them as part of a package of malls divested by The Malls of New England Development. 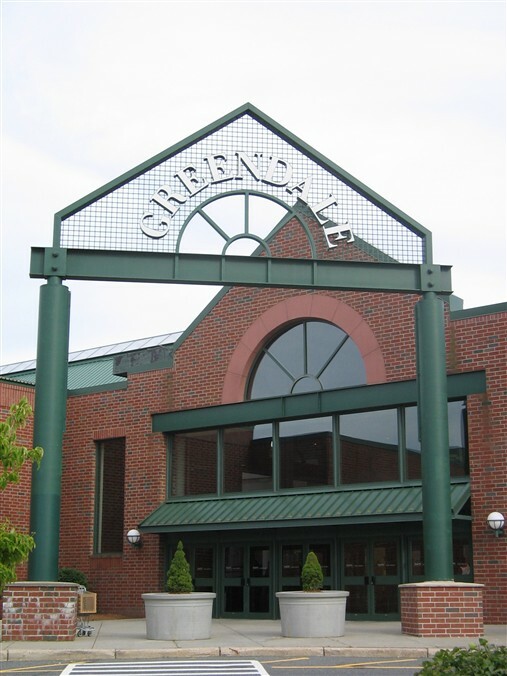 While Greendale’s size and location prevent it from ever being a truly dominant regional mall, it is relatively successful, hosting a variety of mid-level tenants that cater to the immediate area. 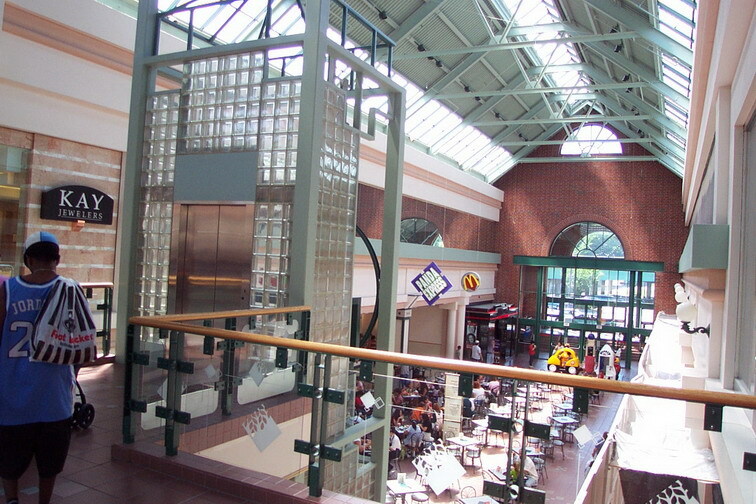 With the 1996 opening of the Solomon Pond Mall approximately 10 miles to the east–the mall that truly became the large, dominant Worcester-area mall–Greendale settled into a niche as the convenience-oriented mall for Worcester residents, since the “big mall” was so far-flung from the city proper. And hey, it has certainly outlasted its bigger cousin downtown. 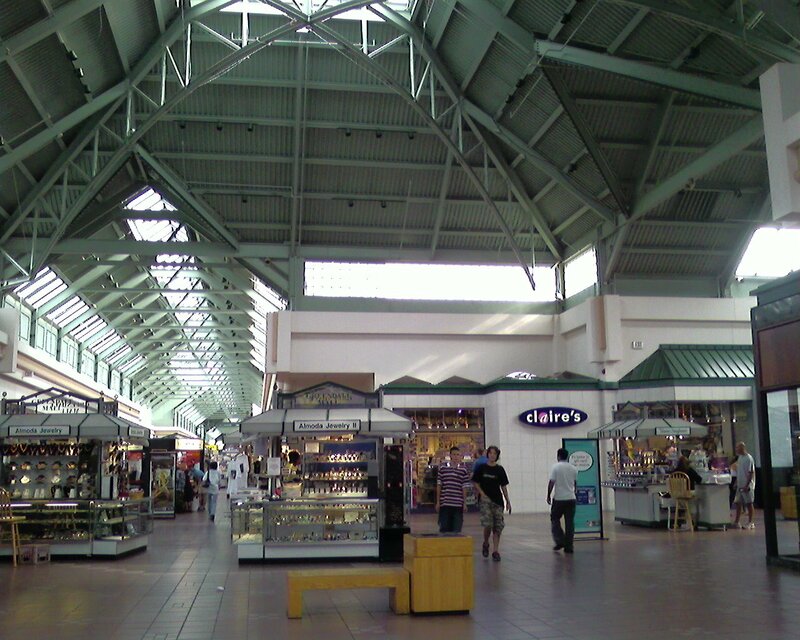 We have two sets of photos of the Greendale Mall, taken five years apart, though not much really changed inbetween. Prangeway took a small set on a trip in 2001, and I took the rest last month (That’s August 2006 to y’all from the future). For such a small mall, it’s a great design. Wow, a mall that features big-box retailers! See, it’s proof a mall can survive with the changing retail scene. Seems like the only option is to demolish it and build a power center that requires you to drive store to store. It’s refreshing to see it can work without doing that. The roof is nice, too. Looks like good Feng Shui. The decor is much better than most malls – and it is impressive to see that they’ve maintained it as an enclosed mall, even with the big box retailers. Unique in a rather homogenous genre. one of those rare malls that actually look appealing and avoid looking over-the-top. 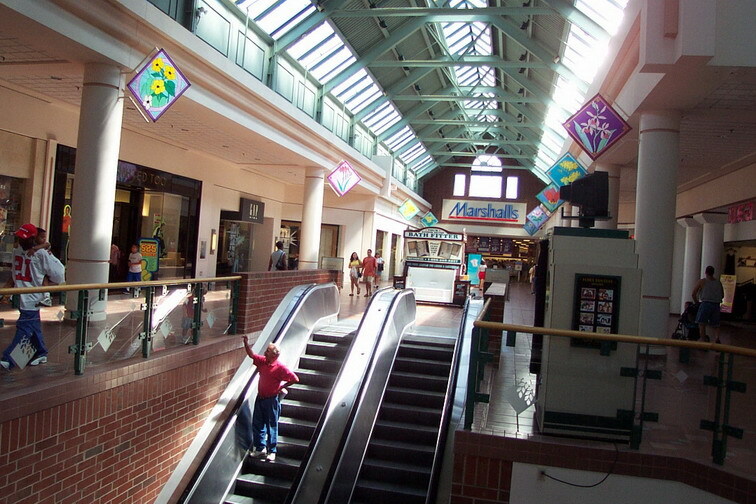 I remeber when this mall opened, It had a Lechmere where Best Buy is now located, a Herman;s Sports, Merry Go Round and a Dream Machine Arcade down on the lower level where the food court. I’m amazed it is still open considering all the issues Worcester has! Greendale opened in mid- to late 1987. It was carved out of the former Riley Stoker building, which soon after became Babcock Borsig Power located in the brick building just next door. 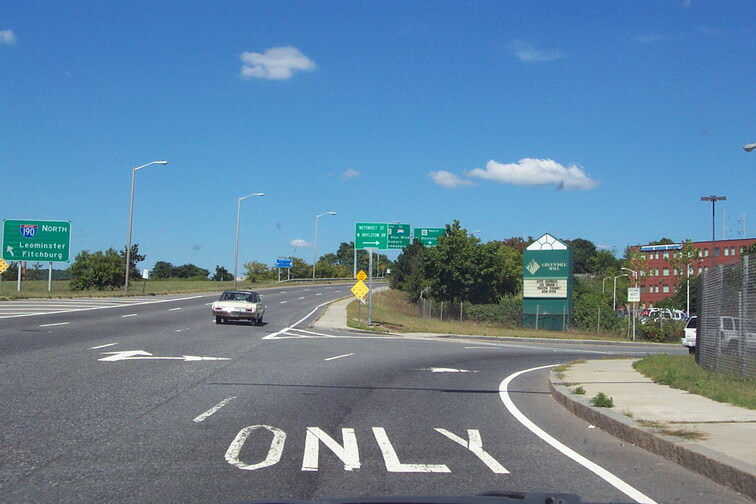 This photo (http://www.bostonroads.com/roads/I-190_MA/img9.gif) shows the exact location in relation to the then-under construction I-190. TJMaxx and the parking area underneath were probably added in the late 90s. 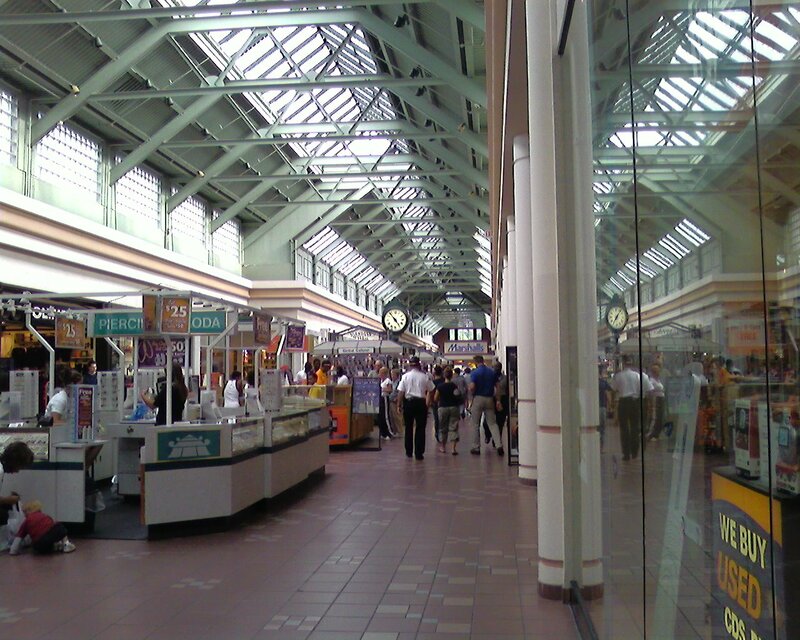 Apart from that, the mall’s remained relatively unchanged in 20 years. 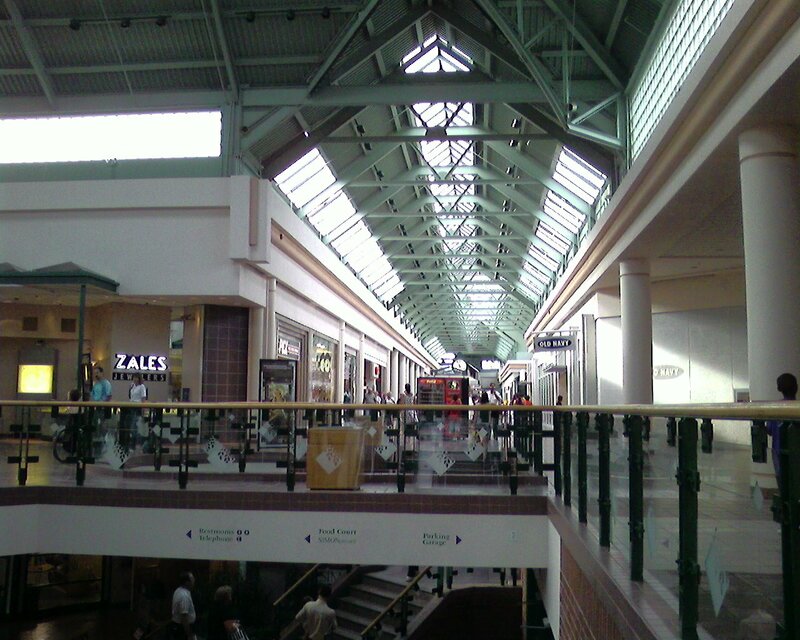 Greendale Mall is one mall that has a lot of great stores. It’s not too large to run in and pick up a few items. Plenty of parking including parking garages in the front and the back. Perfect mall to take an elder parent because it’s not over whelming for them. When it first opened there was a restaurant/bar where the shoe store is now. It was called “Charlie’s”, and it was actually an excellent restaurant. (The stuffed animal heads they had for “decor” on the walls notwithstanding.) I think having a legit restaurant added a lot to this mall as a destination, and it’s demise altered the character, leaving something of a void. 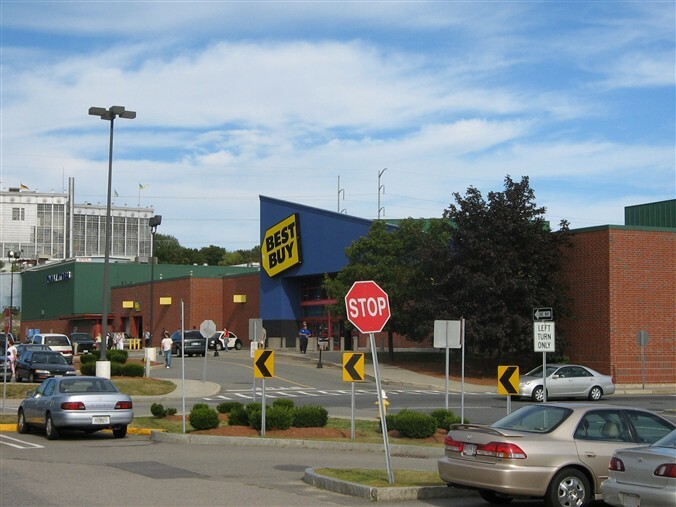 There was an Eastern Mountain Sports store next to what is now Best Buy, (originally Lechmere), on the East Side. Not sure why they closed, although now that I think of it, it was a rather odd “corner” spot in the Mall. 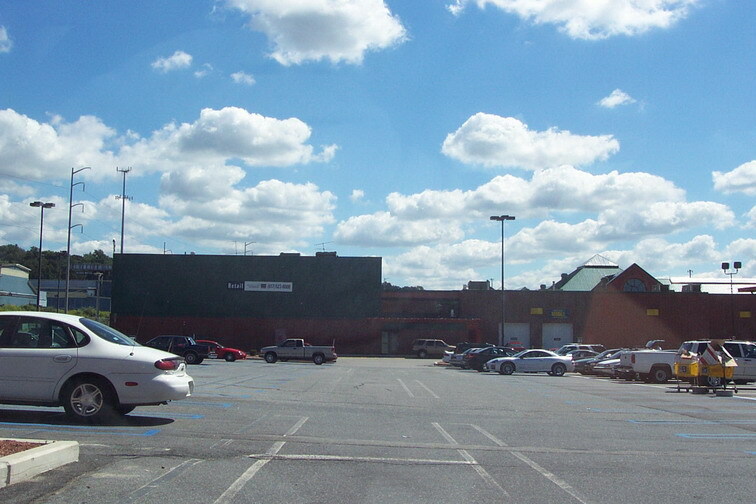 This space remains vacant, and in your 2006 photo you can’t even tell there was ever a store there. I don’t think it’s still there, but the Registry of Motor Vehicles had a satellite office at the Greendale Mall. I would say it was there in the Mid-Late 90s. You could go in and do such things as renew your driver’s license. Seems to me it was on the South Side of the Food Court. The T.J.Max was indeed a later addition. So too was the underground parking garage, or perhaps just some of this garage. Since the T.J. Max addition was erected in what was the parking lot, I think there was some correlation between the two. You don’t want to park under 290. Or worse- just at the *edge* of where you can park under the highway. Especially if there is snow or lots of rainwater on the highway. Whatever slops over the guardrail of the highway comes down on the parked cars. (Think about it.) If the parking lot is jammed, fight the temptation to park under the highway and just wait for a good space to free up. 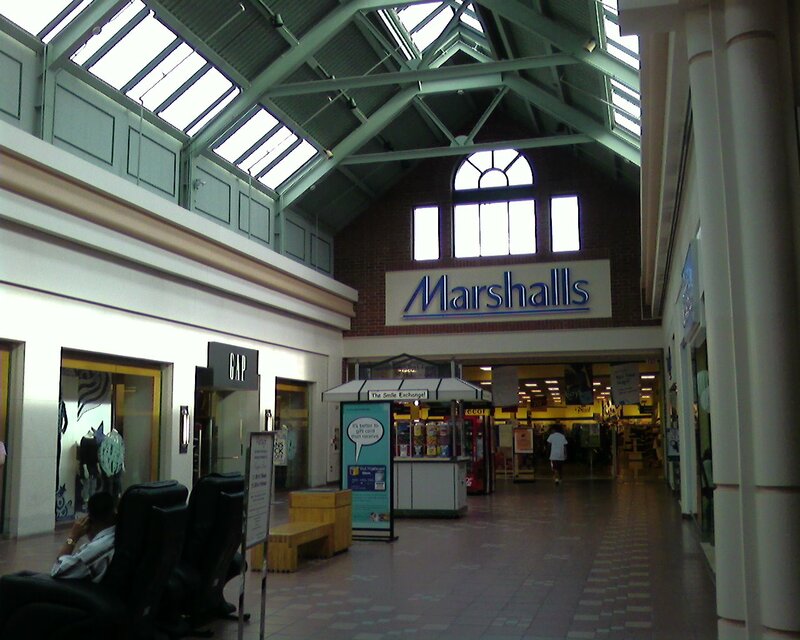 Looks like the Marshalls in the Greendale Mall is closing as of the end of January 2008. An original 20-year-old anchor now gone and possibly among the last remaining original stores. Wonder what’ll happen to this mall, which will likely continue hovering in the limbo between “ancillary mall serving locals” and “soon-to-be-dead”. Will post updates here as I hear them. “Jessca”, this site is not owned or affiliated with any malls on this site. I heard the mall itself is actually closing down and Best Buy will be moving. I have lived in Worcester all my life. Shopped there a ton as well. I never did care for the outlets that came. I still went to Greendale. Going to be a shame if it closes, I see it has a ton of business but I guess that’s just not enough. With the new Lincoln Plaza built I think things have become hard and the store that’s kept Greendale afloat so long is probably Best Buy. Gamestop has a new store in Lincoln Plaza and I’ve noticed more flock there now than in Greendale. Will be sad to see it go if what I heard is true. I loved this mall, been going there since I was a teen. 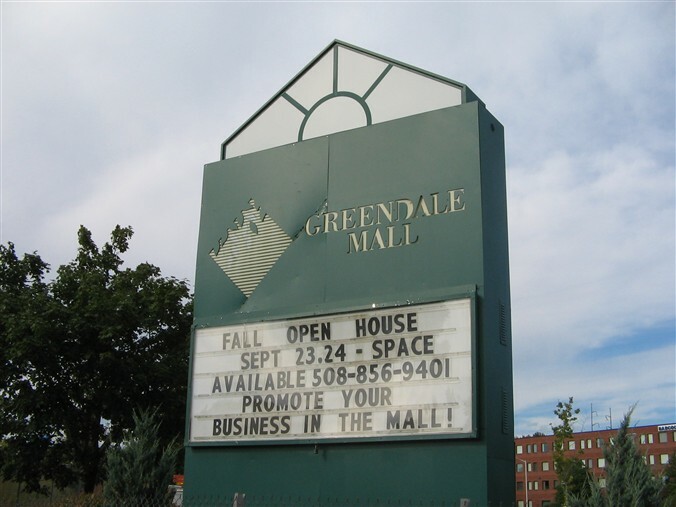 Greendale Mall is a landmark in this area of Worcester- one of the longest standing malls there. It is, indeed, convenient to shop at. I can remember coming home from work and stopping off to pick up a book or a new DVD because it was on my way home. And for those who live in the northern suburbs of Worcester (Holden, Rutland, etc.) this is on the direct route home. There are rumors about the mall closing but as far as I can tell none of them are founded. There were additional rumors about what would replace Marshalls as the anchor but nothing has been introduced yet and Marshalls has been gone for almost a year now. Best Buy may be moving but they would have to break a contract to do so and no one seems to think they’re that desperate to move to Lincoln plaza. Where ‘EMS’ used to be there is now a ‘Rue 21’, considered to be a hip new store. Old Navy was put in during the late 90s, along with DSW, to add 2 more large market stores to the mall. And I think the creation of the Blackstone Shoppes in Millbury did more damage to the mall than the expansion of Lincoln Plaza. But this mall has character and history and has survived the opening of Solomon Pond Mall amongst other setbacks over the years. I think the traffic on every road around the mall yesterday was a clear indication that Greendale’s not going anywhere. For some people, Greendale is a heck of alot more convenient than Solomon Pond or the Blackstone outlets. Me, I can walk there in 5 minutes. That is, when the traffic’s not bumper-to-bumper from last minute shoppers. I do miss that Dream Machine, tho. 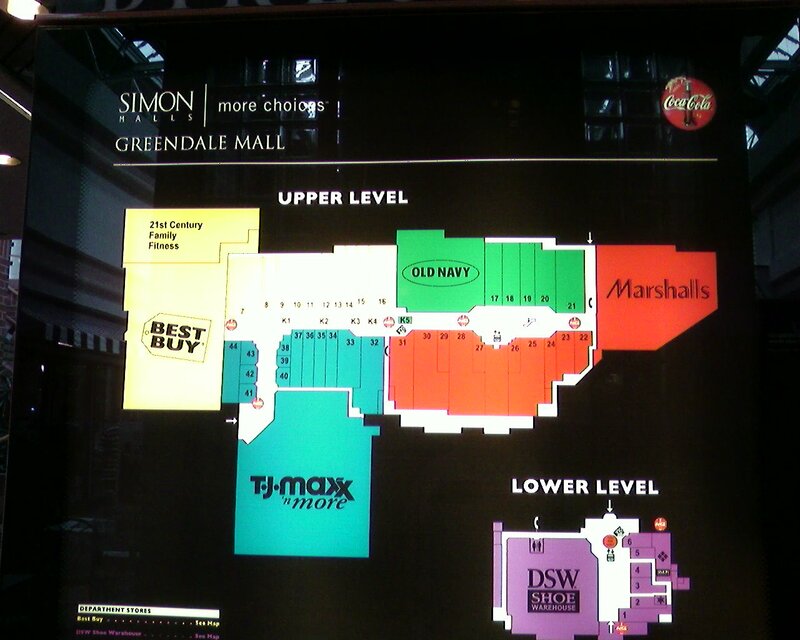 While the Greendale Mall may not be going anywhere – there’s actually no reaspn to go shop there. The mall (never all that great to begin with) has devolved into plenty of nothing: dollar stores, discount shoe stores, etc. I truly believe this mall is doomed in its current incarnation and Simon knows it. The space formerly occupied by Mashalls (one of the mall’s major anchors) has been vacant for nearly a year. Given the current state of retailing, I don’t know how this mall can survive in its current incarnation. I have a feeling it may end up being razed, and wouldn’t be at all surprised if a Wal-mart replaced the whole thing – which would be a shame ‘cos the mall -is- pretty cool, architecturally-speaking..
That Eastern Mountain Sports used to be a Software Etc. Where TJ Maxx is now was a pet store called Pet Menagerie. It only occupied a small space; the Maxx addition came at a later date (mid to late 90s). There was no garage below either. Where Payless Shoes is now used to be Mrs. Field’s cookies, what a treat to walk by and smell the freshly-baked goodness! I was talking to a friend of mine that said that Best Buy would not be renewing its lease with the Greendale Mall, since its sales haven’t been the greatest. The Greendale Mall could actually thrive, but they keep swapping stores in and out like crazy, hence they keep losing customers. When Worcester had the Worcester Common Fashion Outlets and had stores that brought in business, it wasn’t a bad place to go. 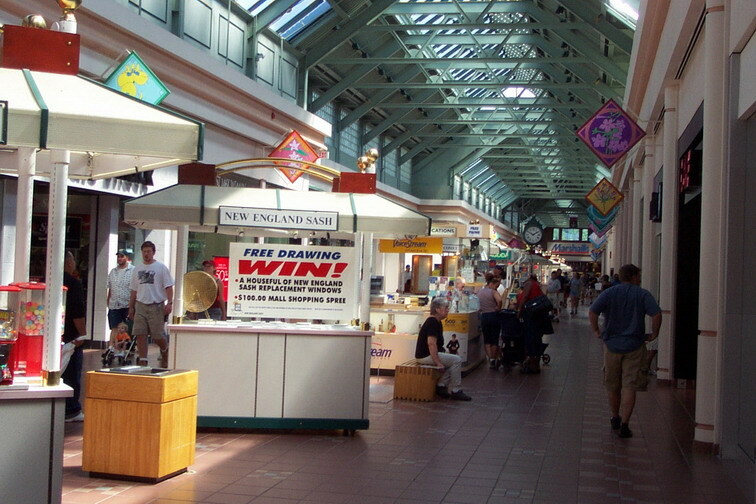 1) Put the stores that exist in the current Greendale Mall and put them in the Worcester Commons and rename it “Mall of Worcester OR Worcester County Mall”. 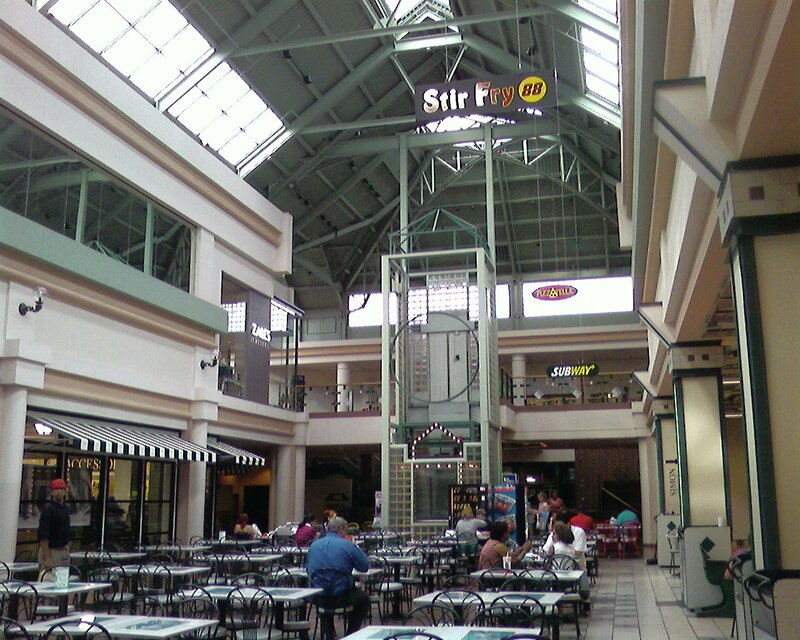 2) Take stores such as Macy’s, JcPenney, and the like and put them in this mall as relocations. 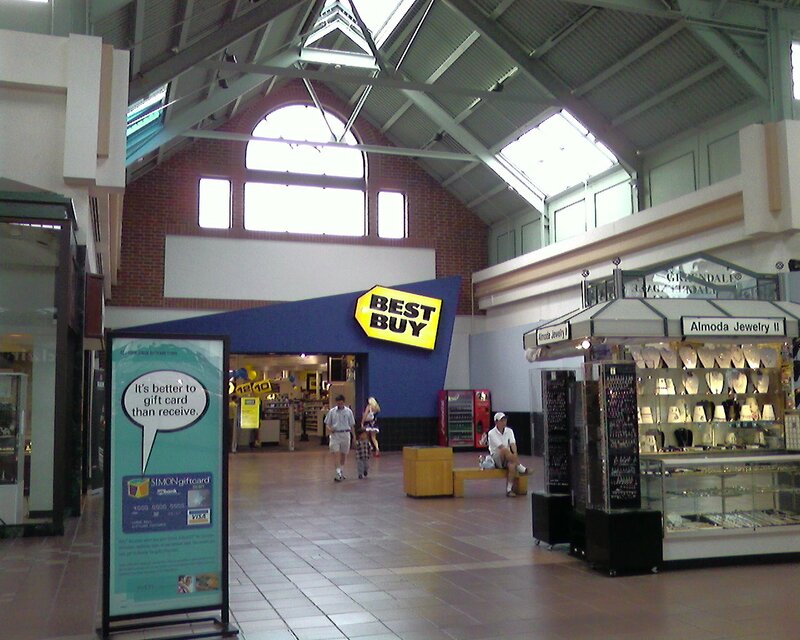 3) Replace Best Buy with either an electronics or computer store. Hopefully this will not only give Solomon Pond some competition, but will give Worcester a nicer mall with a nicer design. Drove by the Greendale Mall yesterday and saw new “Big Lots” signs on the exterior. I assume this is going in the former Marshall’s space. I remember when this mall opened, although I can’t quite pinpoint the year. I’m fairly certain it was around 1990 though… Anyway, although many stores have come and gone, I like the way certain parts have been exactly the same for YEARS. The bathrooms at the end of the long corridor near the food court, next to the stairs, the tiles, the general structure, and even the pay phones on the main level in the middle of the mall. I remember breaking up with my girlfriend on those phone back in 1991! I remember the Record Town and Walden Books downstairs where the shoe store is now. Heck, I remember when that Record Town had that “Personics” system where you chose a bunch of songs to make your own custom CASSETTES! I remember going to the KB to get video games the day they came out, and of course, Lechmere. The only place where you could buy CD players and telescopes. I remember the first Sony Walkman Car Discmans sold there for $300! Those were the days… EMS was a great store too. Lots, and lots of good memories there when I was young. Haven’t been there in a few years…. I went here once during a school trip. The mcdonalds closed before I went there. I remember it was a boring food court. The mall wasn’t much better. I went here in 2007, and I don’t wanna go back.